In my last post, I laid out the infrastructure elements that I need to get my Pre-Launch Book Marketing Plan underway. However, getting all those pieces together will be helpful, but wouldn’t get me very far toward my plan’s goal. So, on July 15th, I am launching an Indiegogo Campaign!!! As a budget-constrained, new author, simply announcing that I have a book coming won’t provide much bang. I really needed to develop some type of campaign that does more than announce that a new author will have a book released soon. Of course, there is the more traditional way of proceeding – lots of reviews by big authors and popular bloggers. That’s a great strategy, if you have the time, the money, and the reach. In the Indie Publishing world, getting to the big name authors is tough; it is more in the domain of the bigger publishing houses. There are a number of strategies for getting reviewed before launching, but I am of the mindset that if my book is ready, I want to take it to market. As I launch and refine my ongoing marketing, I will work on getting book reviews. Why Run A Crowdfunding Campaign? It might be easy to assume that the only reason to run a crowdfunding campaign is because of the money!$!$! There’s no denying that money is part of it. Writing a book is only one part of the equation. It takes more money than you might think to professionally bring a book to market. Beyond the money, I choose a crowdfunding campaign for a number of reasons. It’s about the book, but it’s not about the book – Yes, the campaign is about helping me fund the process of getting my novel into the market. However, with crowdfunding, there’s more than just the book. If all I have to talk about in my pre-launch marketing is the book, that will get old for everyone very quickly. With crowdfunding, I get to talk some about the book, a little about me, and share this crowdfunding process as I step through the process of becoming an Indie Publisher. This gives me a chance to leverage my existing network, and gives others a chance to give me hand, not just with the sale of the book, but also with my dream of becoming a successful Indie Writer & Publisher. General Buzz – No Buzz Lightyear has not been promoted. Crowdfunding still has an aura of fascination about it. It’s still new. It’s still interesting. People are still curious about the ins and outs, what works and what doesn’t. I know that many of the people that I know will be interested in watching me go through this process of my first crowdfunding campaign. Global Reach – I could generate a number of pre-sales for my book through my own personal and professional network, but beyond that, I would have trouble getting traction without something more than the book. A crowdfunding campaign give me that. I’ll have to create a video and offer rewards for contributors. There’s built-in mechanism and incentives for my network to share the campaign, for people that I don’t know to participate in it, and for others to share it. It’s Fun! Like many people, I’ve been watching this crowdfunding phenomenon, and honestly wanted to give it a try. I am excited about learning how the process works. I am excited to share how it works. I have no doubt that there is some work involved, but when you are doing something that you enjoy… is it really work? If you’re interested in following along as I run a crowdfunding campaign and become an Indie Publisher, please follow my blog at SheaOliver.com, friend me on Facebook, and follow me on Twitter. The Cover Image for this blog post was taken at Worlds of Fun amusement park in Kansas City. 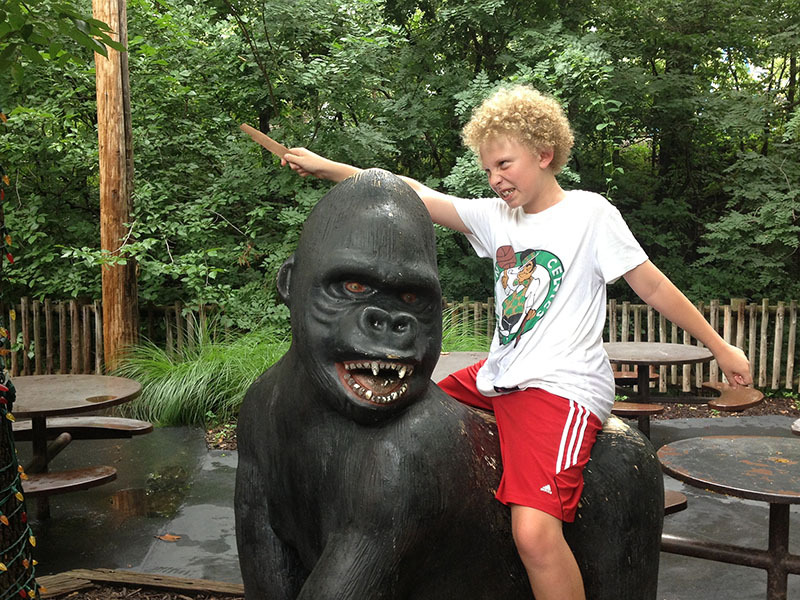 My crazy little Brandon hopped on the gorilla and prepared to charge into battle. That kid’s a goofball!!! He is one awesome crazy little dude!! !